PLEASE NOTE: Because heavy rain is predicted for Saturday, the Fall Harvest Fest potluck is postponed until Sunday, Oct. 28. We hope to see you there! 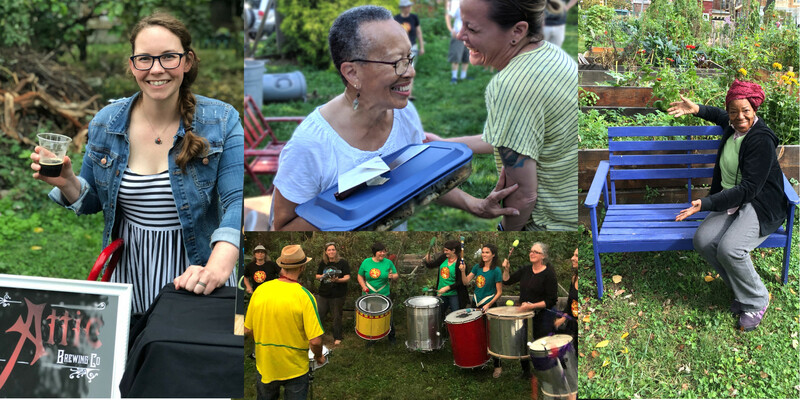 On the evening of Saturday, Oct. 27 Sunday, Oct. 28, Hansberry Garden’s fall harvest festival will offer live music, beer samples from Germantown’s own Attic Brewing Company, and hot dogs and tofu dogs as well as our usual monthly potluck. Members, neighbors, and friends are invited to share food, drink, and conversation. Bring a dish if you can, but feel free to stop by with or without an edible contribution! We’ll start the evening with an open meeting of the garden’s board at 4 p.m. to discuss planning for next year. All members who have ideas about improvements to the garden’s organization and management — especially those who are willing to volunteer time to a task force or committee this winter and next year — are encouraged to attend this part of the gathering. At 5 p.m., we plan to kick off our harvest celebration with a performance by Unidos da Filadelfia Samba School. Drums and dancing will be followed by a potluck dinner enhanced by both meat and meatless items from the grill as well as samples from Attic Brewing Company, a craft brewery that is slated to open in Southwest Germantown early next spring. After dinner, members will inaugurate our new amphitheater with musical performances, and a bonfire is planned to take the edge off the late-October chill. We hope to see you there!